After a couple of days in Popayán, Alix and I made our way north further into Colombia. After a weekend in the southern city of Cali, a hot, humid place reknowned for its nightlife, we continued on to the small Colombian town of Salento and checked into The Plantation House, an old coffee growing farmhouse refitted as a hostel. At around 1500m, rich with volcanic soil and often shrouded in cloud and mist, Salento is a colourful, tidy town in the middle of the coffee growing region of Colombia. Our intention was to go on a coffee plantation tour and see how a coffee farm works, and visit the nearby Valle de Cocora, a valley famous for the concentration of wax palm trees that grow there. While we were there we also hoped to meet up with a fellow traveller, Chris Tripodi, a bit of a travel nut who has been on the road for some 18 months travelling, well, everywhere. After first meeting Chris in the Pantanal, Brazil, we also randomly crossed paths with him in a pizza restaurant in Uyuni, Bolivia. Since then we had bounced a few emails and it seemed likely we could meet up at The Plantation House, which would be a cause for some kind of celebration. The closest coffee farm to Salento was owned by an English gent named Tim, incidentally, also the owner of The Plantation House. Included in the price of the tour was the hire of a pair of gumboots, which we soon discovered come in handy quite a bit in these parts, where the rain comes suddenly and in intense downpours, turning the rich soil to sticky mud. The coffee farm was a short walk from the hostel, built on the side of a beautifully lush hill. Here the coffee bushes are harvested of their cherries and the coffee cherries are manually cranked through a press device that skins the green coffee beans, which are then washed and dried. The coffee farm we visited was a small, boutique affair, very different from the industrial presses and big coffee farms elsewhere in Colombia. The coffee beans were dried on the roof of the farmhouse, a warm place where the cats slept during the day to keep dry. We drank some coffee and I took some photos of this friendly dog with the freaky-looking eyeballs. ...all under the watchful gaze of the dog with the freaky eyes. I had assumed that the coffee would be roasted and packaged at the farm as well, but this is not the case. The vast majority of Colombia’s coffee is for the export market, it is arguably the best Arabica coffee in the world. We learnt that green coffee beans keep better in storage than roasted ones. In addition, different countries prefer different roasts, in Colombia they typically prefer a lighter roast than the darker brown that we drink in Australia. As a result, coffee is usually roasted as close to the time and place that it will be drunk as possible, which in most cases is in a country far away from Colombia. To round out the whole coffee experience, I separately visited the local coffee roaster, a fellow who worked exclusively for the best coffee shop in town, Jesus Martín. Once the moisture has been roasted out of the coffee beans they lose most of their weight- I learnt that there are about 70 coffee beans in a cup of coffee, and the ‘bad beans’- ones that are broken or discoloured- are removed by hand: remarkably time consuming work that made me appreciate the coffee I drank that little bit more. The final product at Jesus Martin Cafe. 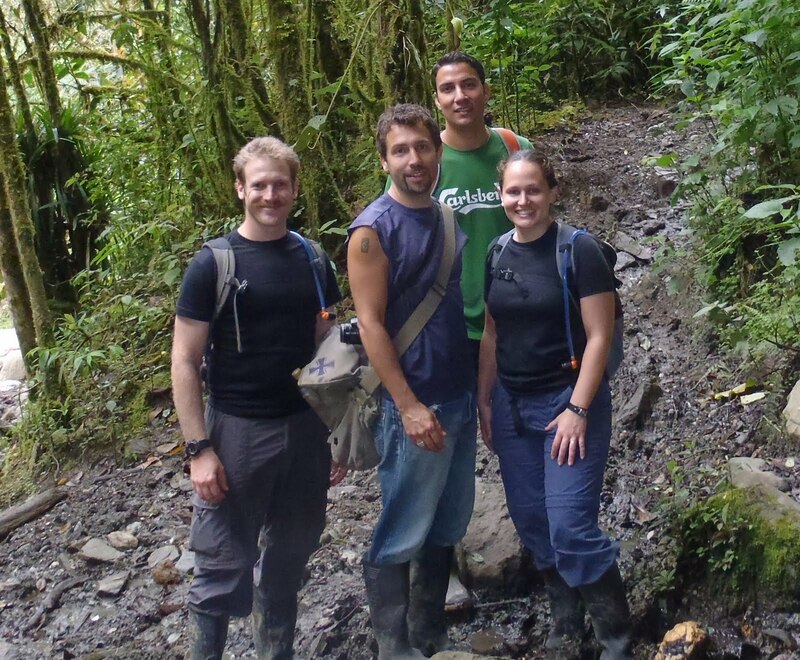 Pretty soon it was time to get back in the gumboots again and visit the beautiful Valle de Cocora. In the mean time our amigo Chris had arrived in Salento with his late travelling companion, Haroun, an amiable bloke who had just finished his bar exam in California law and was killing time in Colombia until his exam results were delivered. We all pulled on the gumboots and went hiking in the Valle together. The hike was 5 hours through some beautiful, if muddy, forest and over some makeshift bridges that added charm to the whole bushwalking experience. The trail led us high above the valley where we could look down into it through the permanent shroud of mist that envelops the valley. Set into the short lush grass, the towering wax palm trees were wonderful to look at. Back at The Plantation House, our experience was mixed. The place had rustic charm and we had the good fortune to meet a lot of new friends there; as it happened there were plenty of people around our age staying at The Plantation House, which is unusual, our experience being that most travellers we meet are either quite a bit younger or older than us. However, apart from the social aspect, the place was a bit of a dump, there were bugs and spiders everywhere and it was generally unfinished and a bit run down. Spiders in the bathroom. Not so great. We decided to move to another hostel, a brand new one named TraLaLa that the proprietor, a Dutch fellow named Hemmo, had opened only two months before. We discovered that many of our new friends were moving there, too, which we all agreed was a justifiable exodus. The Plantation House was described in the guidebooks as ‘the only place to stay in Salento’, most likely an outdated statement of fact rather than a figure of speech. It seemed that since the last guidebook editions were published, new accommodations had sprung up all over Salento, and The Plantation House simply did not compare with the newer competition. We decided to stay several nights at TraLaLa. The bed was extremely comfortable with brand new cotton sheets and fluffy new pillows, the shower produced strong jets of water as hot as you might like them, and everything was faultlessly clean, relaxed and cosy. It was the weekend now, and while Alix decided to have a quiet night, Chris and I decided to check out what small town nightlife Salento had to offer. The main entertainment to seek out was a local favourite pub game named tejo, and so Chris and I made our way to the local pub where we had heard you could play a game or two. There are at least four pubs in Salento, and this one appeared to be the least likely place to find foreigners. Apart from one girl at the wagon-wheel table near the bar, the clientele was exclusively male, mostly unshaven, attired typically in jeans, boots and dusty ponchos. The bar served any kind of drink you wanted provided you wanted to drink beer. It soon became apparent why there weren’t many girls in the place, because there was no restroom in the pub. There was a hole in the floor out the back behind what looked like a shower curtain where a man might relieve himself when he had filled up on beer. Also out the back were the tejo courts, twenty metre long lanes of dirt with raised wooden troughs filled with clay-like mud at either end. Twenty or so cowboys surrounded the courts at tables no more than a few feet from the edges of the lanes. It was Saturday night and we figured the local boys had been there for a while as there were maybe a hundred empty beer bottles on the court tables. The object of the game of tejo is to fling a heavy metal disc, called a tejo, up the court and get it to sink into the clay in the trough at the far end. In the centre of the clay is a metal ring and surrounding the ring are paper packets of gunpowder. When the metal disc contacts the metal ring it sparks, and if you happen to have hit a packet of gunpowder the metallic clash ignites the gunpowder with a tremendous ‘Bang!’ at which point it seems highly appropriate to yell “Tejo!”, especially if you are really quite drunk at the time. If the tejo lands inside the metal ring you get six points, if you get an explosion, you get bonus points for the sheer fun of the thing. The accuracy with which these men can fling a tejo, and the nonchalance they display while other beer drinking men fling potentially deadly chunks of metal past their heads was pretty exhilarating. Chris and I had a crack on the half-length courts we presumed they reserved for women, children and foreigners. It was pretty tricky to play. We were both immensely impressed with ourselves when we finally got some hits and made the gunpowder go bang. Playing tejo was the best cultural experience to be had in Salento, but another highlight was the brunch we had on our last day in the town. Every evening from Monday to Saturday at La Serrana Guesthouse, then again on Sunday for brunch, Joseph the chef cooks up a 9-course extravaganza containing a myriad of flavours for the curious palate. All the food is made from local produce, the milk is fresh from the cows roaming outside and the herbs are clipped from the guesthouse garden hours, maybe minutes before being served at your table. Most extraordinary is the price tag; all nine courses are served for the equivalent of nine Australian dollars. So, altogether our experience in Salento was immensely enjoyable and everyone we met, fellow travellers, local folks, tejo throwing cowboys, everyone was really very friendly and pleasant to be around. Thank you to all those folks who helped to make our time in Salento an enjoyable one. You know who you are! I stayed at La Serrana and really enjoyed it. Ate with Chef Joseph 3 nights in a row - still recovering! He's actually moved on now to Santa Marta and is cooking for 17K so looks like we all got a deal. Is the next course a hammock? We met some people who went to (part of) a dinner here in Taganga. They left after the second course; apparently it was really bad, unfortunately.